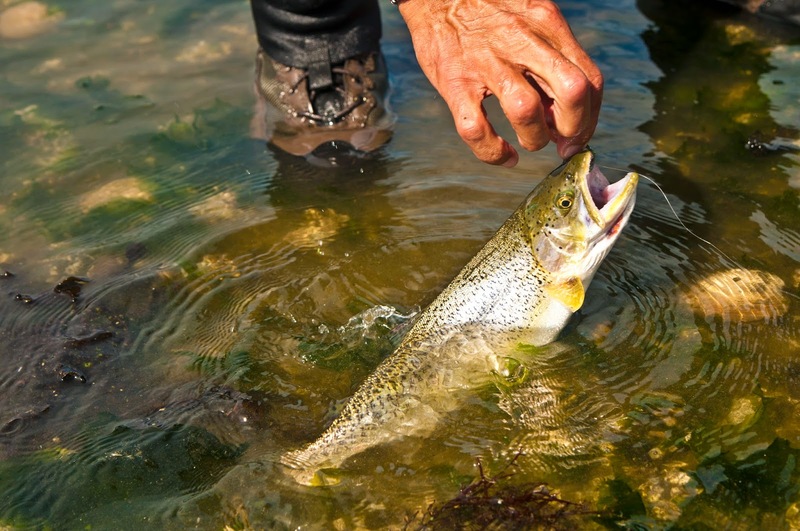 washington fly fishing: Spring Trout! Tomorrow is the big, statewide trout lake fishing season Opening Day, and I won't be there. It's not that I don't like lake fishing- I do. I have enjoyed lake fishing from the day that I caught my first trout in an Adirondack Mountain lake when I was two years old. And I have been fishing lakes ever since then. As a boy I fished with worms and minnows, and eventually with spinners and plugs and spoons, in every suburban New York state lake and pond that I could get to on my bike. Some of these lakes were public. Many were not. And most of them were clearly posted. No one can stop a 12 year old with a fishing rod, and there were too many good fishing lakes to ignore, and so many different kinds of fish to catch. There were trout in some places, but there were also crappie, sunfish, bluegills, perch, walleye, pike, and bass. Largemouth bass. Once I discovered Largemouth bass my life began to take a definite course- Always towards water. By the time I was in my second year of the fifth grade I knew most of the best bass fishing lakes withing striking distance of school. So if you twist my arm, we just might go lake fishing for trout out here too. Of all the things that I have wanted to do in fishing, it has always been about the wild fish, wilderness, and solitude for me. That's why I fish these beaches for sea-runs. We just don't see the kinds of crowds here that you might on some other trout waters. Especially Washington's trout lakes on Opening Day. And by now the Cutthroat have had time to get fat already, gorging on plentiful forage, as we have seen huge counts on juvenile chum salmon at some of the smolt counting locations out here. One tiny stream here generated over one million chum fry this spring! And we are seeing big numbers of Pink salmon fry moving out into the saltwater this spring as well. There are some very robust trout around now. And they don't need much convincing to take your fly. As the weather is warming up, and we are getting more sunny days, this is only going to get better. Don't forget that the juvenile Herring and Sandlance are growing every day too. Right now I will be using very small patterns, down to an inch or less in length, very sparse, on #8 and #10 hooks. Over the next month my bait fish patterns will be getting a little longer each week. These are pleasant days spent on broad, fairly flat and firm, gravel and sand beaches. We take a few breaks along the way, and we have a nice picnic lunch too. If it's damp and chilly we might make some hot tea or coffee. On the clear days you will see Mt Ranier, Mt Baker and the Olympic Mountain peaks. We are surrounded by beauty. We see many species of sea and shore birds, eagles and osprey, otters and seals, and sometimes even whales. All with simple walk and wade access. 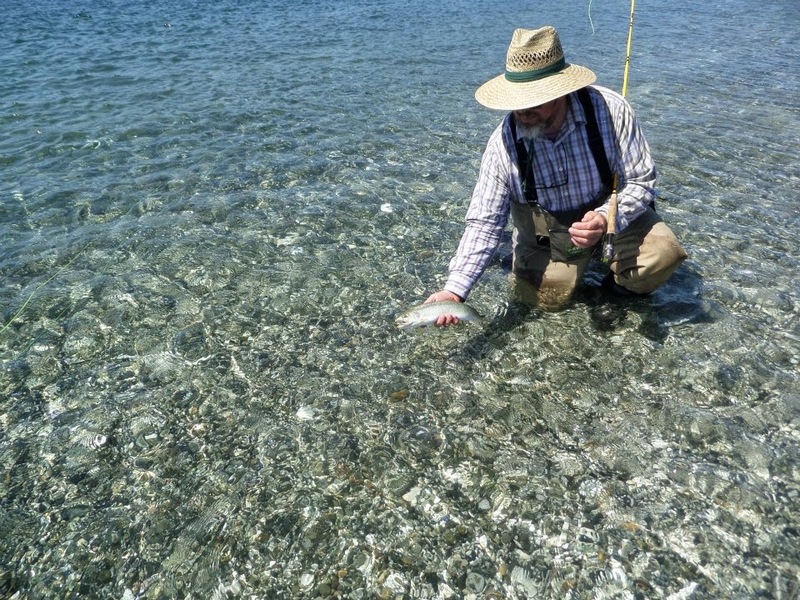 We don't wade more than knee deep, and the fish are usually in close in the shallows. Trout fishermen will understand this game. Our unique tidal currents here create river like flows. That's where the trout are, most of the time. We use a broad range of flies, some being well-known trout patterns, and others are regional favorites for saltwater. (There's more about these flies on some of my previous postings here.) Local knowledge of the trout and their prey, and their habitats and behavior, is key to success. That's what I have been doing out here for the last fourteen years- Haunting these beaches, reading the water, learning the signs, chasing these wild trout. And we do catch a few. A salty sea-run Cutthroat. That's what I'm talking about! So if you want to avoid the crowds, and meet up with some of the wildest, brightest sparkling jewels of the Puget Sound waters, come up and fish with me on the Olympic Peninsula beaches. Call or write for details. Beginners to expert- all are welcome. Certified Fly casting and Fly Fishing Instruction. I am in my 34th year of fly fishing.